RealAutoTips. - What happen with New Yamaha YZF-R1 after completed with New Termignoni? Although the power of 200 horsepower is considered more than enough for most riders superbike. But for the speed enthusiast or sensation of driving fast on the track, the 200 horsepower may not be enough. One common solution is offered for those who refuse to complicated is the slip-on exhaust pairs. As is always carried out by the manufacturer of aftermarket exhaust Termignoni them. According Metrotvnews (08 Juli 2015), that New Yamaha YZF-R1 has now been equipped with a muffler New Termignoni, manufactured using the same material as the exhaust Termignoni Reparto Corse, and the use of a silencer that is in MotoGP and other top-level racing series. New Termignoni exhaust tebuat offer of the fiber material carbon fiber slip-on cans, and titanium one. There is also another version without the use of a catalytic converter as an option for use on the race track. Catalytic converter befungsi reduce exhaust emissions of the engine, the material used was relatively mild so as to reduce the weight of the vehicle, and at the same time improving performance. Termignoni use cuNb titanium alloy materials, such as those used in the manufacture of racing exhaust. Excess material is capable of maintaining the temperature is not too hot, has excellent strength, as well as environmentally friendly. The strength of this lightweight material can withstand temperatures above 600 degrees Celsius (112 F), while on the arms will resist oxidation up to temperatures above 800 degrees Celsius (1472 F). Termignoni without a version of the catalyst can significantly reduce the weight of the system, but it can generate additional power of up to 4 horsepower. 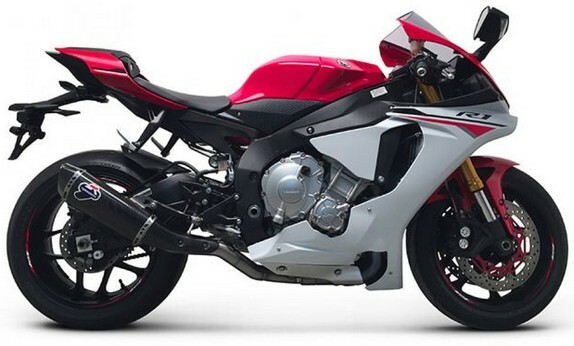 This means that Yamaha YZF-R1 produces 204 horsepower at 13,500 rpm. With the reduction in weight of the vehicle, this will be a very agile motorcycle. This exhaust is produced using two types of material, namely carbon and titanium.